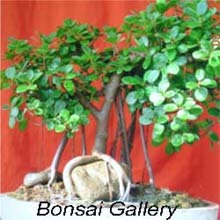 The Gallery :- Bonsai is made of two Japanese word - 'bon' meaning small pot and 'sai' meaning plant. When you grow a tree in a small pot, it's growth will reduce. That's is why, a good bonsai should look a scaled down structure of a tree. Bonsai tree development is a Art and not Horticulture. Developing bonsai tree is very easy, but you require some imagination and patience. It's like developing tree in a limited space. 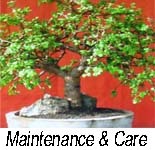 If proper care is taken, then the life of bonsai tree is almost equal to the natural tree. Remember that if you control the growth of the roots and sometime trim the tip of the plant, you can develop a bonsai tree. Do not allow the wild growth of tree and then cutting it to give shape of a bonsai tree. 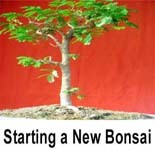 Bonsai is a good hobby, which can be used as a small scale business, if need arise. Most of the bonsai trees shown here and in gallery trees have been developed in our home and I am sure that after going through the contents you will be able to develop your own bonsai trees..
Their are a lots of tree, which can be developed as bonsai tree. However please select only those trees which has got a long life, small flowers and fruit. 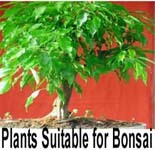 Select a plant, which has got lots of leaves and grows in multi-direction. 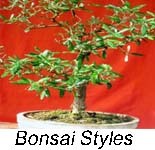 We have mentioned a few of them (which are easily available) in our 'Plants suitable for bonsai tree' .. list. 4) Planting in a Pot -Steps for planting in a pot. 1)	Re-potting - It's required because - the pot size is not sufficient for the developed bonsai / pot got damaged / roots are required to be trimmed / a new pot is required to enhance the look of bonsai. 2)	Trimming - This is a essential part of bonsai development to control the excess growth and to give the tree a suitable style. 3)	Watering - A controlled watering is essential for healthy growth. Since bonsai tree are potted in a pot and generally kept in a safe place, therefore they are less susceptible to disease. However some time you may find ants, bugs, caterpillars, black spot etc. on your plant. Treat it immediately with common medicine like pesticide, Dietz, Malathion etc. Wash your plant with a very diluted solution. You may take advice from your horticulture store for this purpose. Never use a very strong medicine used for curing big trees or to cure a farmer's field. 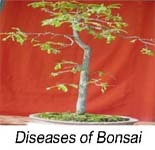 Bonsai trees are to be treated with diluted medicine as child. Occasionally washing of trees with diluted solution is an important part of bonsai tree development.